Today's special guest post is by Nicole Longstreath, one of my fellow bloggers at The S.W.A.P. Team. We've swapped blogs for a day, so read on for her tutorial on how to make a fabulous fashionable accessory out of a plain white t-shirt. In late December, I made a 2011 resolution to consume less. I was inspired by the collaborative consumption movement and a desire to focus on life and not stuff. So when I heard people were taking their unwanted T-shirts and turning them into trendy necklace-scarves, I couldn't be more inspired. Tons of throw-away clothing like this ends up in landfills - what better way to encourage people to explore their inner DIY fashionista using existing materials? In the age of YouTube, a variety of tutorials are only a click away, so I did a Google search for "T-shirt necklace" and it yielded quite a few results. If I was looking for elaborately-crafted T-shirt necklaces, I had found it. There were braided ones, fringy ones and beaded ones. Ones which looked like flowery lady-bibs and others which were a rainbow of high-brow gray. Some had feathers, half had rosettes but none looked like something I would care to create or even wear. They were gorgeous art projects and I admired the re-purposeful spirit, but most of them just weren't appropriate for me. I wanted to make one of these T-shirt necklaces, but I didn't want it to be a DIY disaster and I wanted to be able to actually wear it and maybe even get a few compliments. 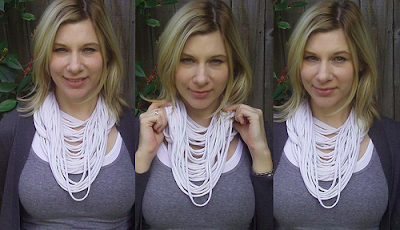 So I decided to find a good white T-shirt and make a new classic, The Plain White T-Shirt Necklace. Find an unwanted but good-quality, heavy-weight T-shirt in white - the kind with no seams down the sides. 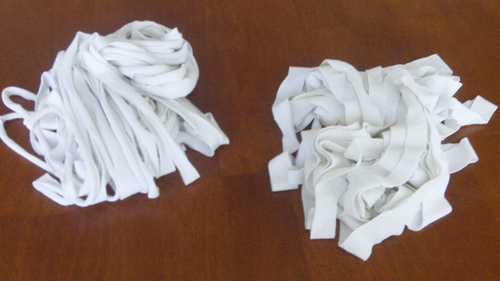 Cut main body of T-shirt into 1-inch strips. Save one strip and snip it open to create one long strip. Set aside. Stretch out all the loops. Leave a little bit of slack or bounce so they don't look totally stretched out. 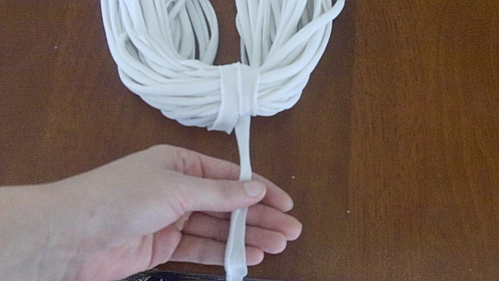 Make figure-8 with a strip, fold in half and slip both loops around your head. Adjust to the longest length at the bottom but note where the smaller loop is on your chest. You've just made your guide; these are the highest and lowest points of the necklace, so just keep making figure-8s and adjust to fill in. I would recommend alternating placement of each loop so you don't end up with a “stack” effect. Carefully take off the necklace you just created by placing your fingers around the point of the necklace which is on the back of your neck. Keep your fingers wrapped around that section. This is the “back” of your necklace. Take the loop you set aside and wind it around the back of your necklace, creating a 1 1/2” wrap around the bunch of loops, but leaving a small amount to tie up with once you can wind no more. Wear with jeans, tank top and a light cardigan. Wait for the compliments to come in. There you have it - you're very own, practical Plain White T-shirt necklace. Cool enough to impress, but grown-up enough to wear with a straight face. Thanks Nicole! Over at In the Loupe, her blog about social responsibility, you can check out my post on 5 Ways to Afford Ethical Shopping. Photographs and text by Nicole Longstreath. © All rights reserved. I really like this idea and will definitely be testing it out. Thanks! That is damn cool! I want one but I'm too busy to make one. Are you selling them Nicole?